“Birtherism is now federal policy. Anyone who is not white is suspected of not being a real American,” tweeted former Republican Max Boot. People with birth certificates are being denied passports because the government doesn’t “believe” that they are citizens—probably because they aren’t white. George W. Bush had sometimes done the same thing, but a 2009 government settlement stopped most of the passport denials. Now thousands of Hispanics along the border are accused of using fraudulent birth certificates. Even with official U.S. birth certificates passport applicants are being jailed in immigration detention centers and being entered into deportation proceedings. Others in Mexico with legal passports cannot reenter the U.S. because their passports are revoked. Passport applicants able to afford legal costs for suing the government typically win their cases, but many of this population cannot afford the fees and lawyers. Thousands of immigrants from Vietnam protected by a treaty are also being deported, facing danger because they supported the U.S.-backed state of South Vietnam. Most of them came to the U.S. before 1995 when diplomatic relations between Vietnam and the U.S. were resumed. Almost 2 million refugees left Vietnam after the war because they faced reprisals for working for the South Vietnamese government. Less than a year ago, Vietnam listed a U.S.-based group loyal to South Vietnam as a terrorist organization and jailed four people for 7-to-12 years for flying the South Vietnamese flag. Stephen Miller, white supremacist aide to Dictator Donald Trump (DDT) created the policy that any noncitizen found guilty of a crime, even as small as a DUI, does not have immunity to deportation. Vietnam does not want the deportees, and they have no idea how to live in that country. Some of their crimes when they first arrived, bullied and growing up in poor neighborhoods. DDT’s deportation of Mauritanians, another vulnerable population of people who have lived peacefully in the U.S. for many years, drives them into slavery and violence if they are forced to return to Mauritania. DDT has moved on to other diversions, but DDT’s top economic adviser Larry Kudlow said that an investigation into anti-conservative viewpoints will be “put through.” At the same time, Congress is looking into “bias” in “social media” and considering regulations for these private companies. At the same time, the U.S. government is using fake Facebook accounts in Cuba to clandestinely foment protest, according to the “Congressional Budget Justification[s]” from the U.S. Agency for Global Media, formerly the Broadcasting Board of Governors. The “non-branded local Facebook accounts to disseminate information … will be replicated on other preferred social media networks.” Last year’s report included a similar strategy with the rational that “native pages increase the chances of appearing on Cuban Facebook users newsfeeds.” Any success of this project could expand to foment clandestine protests in the U.S. Congress might want to investigate that issue. A “perjury trap”: no one can make him lie in court unless he makes the decision to lie, and Mueller probably won’t indict a sitting president. Cohen’s crimes: yes, DDT, the campaign finance violations are crimes. Paul Manafort: DDT says that the man found guilty of eight counts—thus far—and not acquitted of the others should be considered innocent. Popularity among women: DDT says 52 percent, but that’s just white women; with all women, it’s 41 percent. Stealing political slogans: DDT complains that “Promises Made, Promises Kept” was taken by Bill DeBlasio, but DDT took it from Barack Obama’s 2012 campaign and Michigan Gov. John Engler in 1994. Ronald Reagan’s slogan was “Let’s Make America Great Again.” Rep. Nancy Pelosi (D-CA) used “drain the swamp” in 2006. Tax cuts: no, they aren’t the biggest. The $1.5 trillion tax cut over 10 years ranks #12. (Maybe that’s why he’s pushing for more tax cuts this fall.) Thus far, the cuts are putting an extra $17 a month into take-home pay after factoring in higher state and local taxes while inflation has dropped wages in the past year. Environmental quality: the U.S. is definitely not #1; it ranks #27. The U.S. ranks #87, behind the Philippines, in dangerous soot exposure levels, and #66 in smog. Crime and immigration: Most of the MS-13 members caught are U.S. citizens, and there’s no indication that gang members “poured in” under President Obama. The total number of 10,000 in the U.S. is about the same as a decade ago. The DOJ stated that the Obama administration was especially successful in 2009 and 2010. Studies show that immigration doesn’t lead to increased crime. Foreign-born immigrants are less likely to commit crime than native-born Americans. Clinton emails: DDT falsely claimed that the FBI ignored “675,000 Crooked Hillary Clinton Emails” that he knows are “really bad.” The lies came from the racist conspiracy-filled website produced by The Federalist. DDT threatened to “get involved.” The FBI confirmed that DDT’s statements about China hacking Clinton’s emails were a lie, that there was no evidence of any breach in her server. DDT even lies to Christian evangelicals. At his special dinner for evangelicals at the White House, DDT told attendees that he had gotten “rid of” a law forbidding churches and charitable organizations from endorsing political candidates. Congress was unable to kill the Johnson Amendment last year, and it’s still on the books. DDT told his audience to break the law before he said that the upcoming election is “a referendum on your religion.” I guess that he doesn’t find himself a part of evangelical Christianity. After a man with an arsenal was arrested for threatening to murder reporters at the Boston Globe as “enemies of the people,” DDT ratcheted up the hatred by claiming that these “enemies” are connected to “left-wing haters, angry mobs, deep-state radicals” of the Democratic party in some bizarre “deep-state” conspiracy against himself. DDT thinks that the stripes in the U.S. flag might be blue and not red. 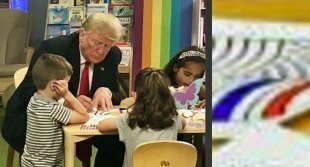 That’s how he colored them when he was touring the Nationwide Children’s Hospital in Columbus with First Lady Melania Trump and HHS Secretary Alex Azar. 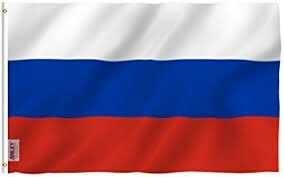 The flag of the Russian Federation (right) does have blue stripes. And no, the photo of him is not photoshopped. A few hours after he couldn’t remember the colors of the flag, he attacked CBS and ESPN over the NFL’s protest controversy about the police killing blacks, again bragging about his love for the U.S. flag. The U.S. government claimed it met the July 26 deadline to return migrant children to their parents by declaring that over 700 of them were “ineligible” out of the approximately 2,500 separated children. The judge who ordered reunification didn’t swallow the excuse. He ordered the feds to provide “detailed information” about each one and weekly status reports with telephonic conferences until resolutions. Then DOJ decided it wouldn’t take responsibility for the crisis it caused. Instead, it wanted to dump their problems onto the ACLU who had sued the government for reunification. Last Thursday, the DOJ told a federal judge that they are not responsible for finding the 400+ parents who they deported and can’t be bothered to find. Instead, the DOJ claims, the court should require the ACLU to “fulfill their obligations to their clients.” And the DOJ wants the ACLU to tell them all information about the located parents. The ACLU had already found 12 deported parents but discovered that they were in contact with the government, which had not shared this information with the ACLU. Yesterday, a judge called DDT’s plan to turn the work over to the ACLU “unacceptable.” The inability “to track and unite … is 100 percent the responsibility of the administration.” He gave the government an August 10 deadline to provide information on separated families to the ACLU. The judge also clearly stated that parents with minor criminal charges cannot be permanently ineligible for reunification. In addition, the judge ordered the government to “identify an individual or a team” to create and implement a procedure for those kids to be reunified with their families because it appears that the government has no plan for the remaining families. At Albence’s “summer camps” in Arizona, two youth care workers were charged with sexually assaulting immigrant teenagers in the most recent claims of abuse at the privatized “shelters” for children taken from their parents at the Mexico border. One of the ex-workers, who is HIV positive, tried to get boys to anally penetrate him. Both centers are operated by the Texas company Southwest Key Programs that received almost $1 billion in taxpayer money to provide services to immigrant children. Allegations against the worker were first reported to Mesa Police Department over a year ago. The other man charged worked at a migrant center that Melania Trump visited. A federal judge has ordered the federal government not to give psychotropic medication to migrant children at Shiloh Residential Treatment Center in Manvel (TX) without parents’ or guardians’ consent except in dire emergencies. She also ordered all children moved out of the facility except for those diagnosed as “risk of harm” to themselves or others by a licensed professional. Government officials denied that medications were only on “an emergency basis,” but children gave testimony that they were given pills “every morning and every night.” Some were forcibly injected with drugs. They suffered nausea, dizziness, depression, and weight gain. The doctor prescribing the drugs lacked board certification for child and adolescent treatment for almost ten years. Shiloh also has a history of other child abuse. The families designated for reunification faced chaotic situations. Some children in New York were driven from one airport to another to find lights. Mayor Bill de Blasio said that about 100 children remain in New York, “with no end in sight.” Some parents defined as “released” stayed in custody for up to a week with no access to showers, phones, or religious services. Some returned children are sick and beaten, and one child even died soon after she was returned. Others were taken places with no one waiting because parents were deported. Volunteer groups frantically raised funds to help children and parents who were just dropped off with no food or ways to communicate with anyone. Families are afraid to line up for help because the separation happened after promises of assistance to them. Some parents waived rights to be reunified because they could not read the consent form and were told that they could see their children if they signed the form. Even with reunification, some children don’t recognize their parents because they were separated for so long, and others are terrified that the government will take them from their parents again. The biggest dodge to claim “mission accomplished” for a federal judge were the parents who DHS regarded as “either not eligible, or not yet known to be eligible, for reunification.” Of these, 64 were considered criminals, an overly broad classification because some of them had not been convicted of a crime. Crimes might be a DUI or simply “wanted in El Salvador.” Another 463 parents were “not in the U.S.,” with 411 probably deported. As for the 260 parents requiring “further evaluation,” the government lawyer tried to explain that among those 260 parents, some had already been released from immigration detention and couldn’t be found. Others are children already released to non-parent families in the U.S.
Conservatives praised U.S. agencies for how hard they worked to reunify families. The only reason that they had to manually go through 12,000 records instead of “at the stroke of keystrokes … within seconds,” as HHS Secretary Alex Azar bragged about his ability to “find any child within our care for any parent,” is that not one of the three agencies in charge had any system for returning children to the parents. Azar made that statement in June; he’s been very quiet since then. DDT’s administration never intended to reunify families, and the court ruling requiring them to put migrant children back with their parents came as a shock to them. This article describes the problems and the processes. Scott Lloyd, a DDT appointment to lead the Office of Refugee Resettlement, set up a roadblock to reunification with his demand that he personally review each request to release migrant children. He made that decision without any agency review and changed it only after the policy was stopped by an injunction last month after a lawsuit challenged Lloyd’s policy. Children are incarcerated for months waiting for him to personally sign releases. In one case, he claimed a 17-year-old boy was a gang member with no proof; the boy lacked the tattoos that Lloyd claimed he saw. He became infamous when he unconstitutionally blocked an abortion for a raped teenage girl and other undocumented teenage girls. His experience for the current job was as a policy worker with the Knights of Columbus that involved research and advocacy for Christians persecuted in Iraq. To permanently conceal ICE crimes, the National Archives and Records Administration (NARA) approved ICE’s request to destroy its records related to in-custody deaths, sexual assault, and solitary confinement. ICE also lists only 112 facilities although 203 have been identified. Since January, ICE stripped away due process, privatized detention services to deadly companies, collaborated with local law enforcement to racially target people, gone after domestic abuse victims, doctored documents to detain protected immigrants, and used children as bait to arrest their parents. Many conservatives, led by the Fox network, consistently minimize the pain of immigrants. Pundits such as Laura Ingraham talk about the “phony concern for the children” by the left. Brian Kilmeade of Fox & Friends, said, “These aren’t our kids…. It’s not like [DDT] is doing this to the people of Idaho or Texas.” According to a recent study, people watching Fox and/or reading Breitbart are more likely to support child/family separation. On The Next Revolution with Steve Hilton, Ann Coulter accused separated migrant children of being “child actors weeping and crying … being coached, … given scripts to read by liberals.” The same accusation was given for gun safety activists from Parkland (FL). Conservatives are accused of having “no heart.” It’s not true: conservatives have heart but just for a highly limited number of people within their own small tribe that looks exactly like them—namely white for U.S. conservatives. That’s why they can subscribe to genocide. 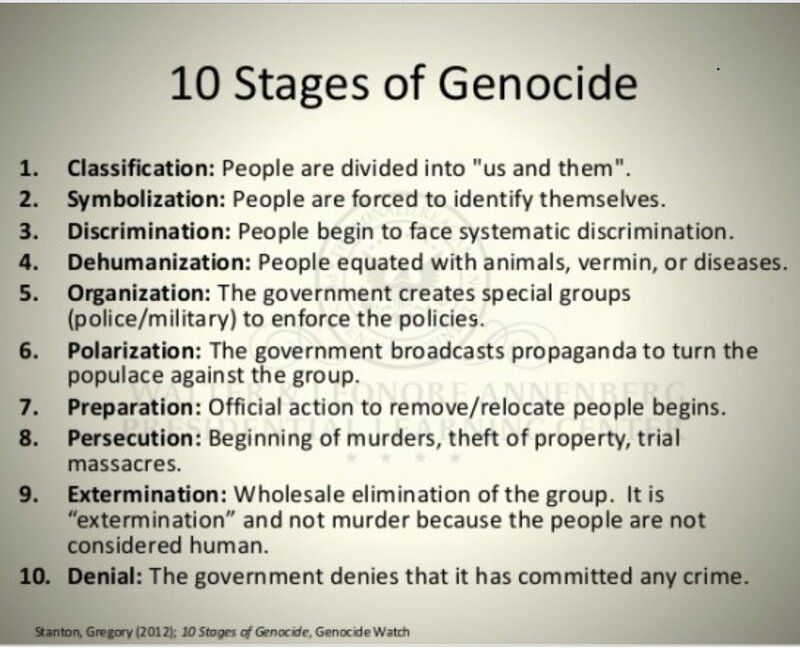 We’re up past Step 8 (above) in the United States. Congress has temporarily lost the battle for Trumpcare and is moving on to another well-publicized disaster: reduction in immigration. Bills in Congress are almost always presented with little fanfare other than a press release. In his need to distract the public from his other debacles, however, Dictator Donald Trump (DDT) jumped on an anti-immigration bill reissued by GOP Sens. Tom Cotton (AR) and David Perdue (GA) in a White House “bill-cutting” presentation. The proposal cuts the number of legal immigrants admitted to the U.S. by one half and restricts them to highly educated, well-to-do, English-speaking people. A description of the point system in the bill is here. Republicans in the Senate were badly split over the healthcare from endorsing cruel provisions to attempting to protect people. This bill will have equal or worse divisions because some Republicans will understand that farmers can go bankrupt without immigrant workers and perceive that the select group allowed into the country will push higher-wage workers out of their jobs. Even if unanimous among GOP senators, the Senate would need eight Democrats supporting the bill. Odd, too, is DDT’s excitement of this limitation after he increased the number of H-2B visas for non-agricultural industry workers like his workers at Mar-a-Lago. Before that he suspended the “premium processing” option for H-1B visas for highly skilled workers. Graham pointed out that the legislation “incentivizes more illegal immigration.” His bill to allow DREAMers to stay in the U.S. has already picked up support from GOP Sens. Jeff Flake (AZ), Dean Heller (NV), and Lisa Murkowski (AK). Also opposed to RAZE is Sen. John McCain (R-AZ). The Cato Institute explained the faulty reasoning behind the Cotton/Perdue plan: “When measured over a period of 10 years or more, the impact of immigration on the wages of native-born workers overall is very small.” (National Academy of Sciences) An examination of the 1964 termination of the Bracero program supports this finding. When farmers lost immigrant workers, they changed their crops to those requiring fewer workers. Immigrants and U.S.-born workers usually don’t compete because they turn to different job markets. Instead they complement each other and increase each others’ productivity. The nonpartisan American Immigration Council reports that better education and an aging population has decreased the number of U.S.-born workers willing or available to take low-paying jobs. Even so, non-citizens and naturalized citizens are far outnumbered by U.S.-born citizens. Immigrants are less likely to commit serious crimes or be behind bars than native-born people are, and high rates of immigration are associated with lower rates of violent crime and property crime. “As Congress and the Administration prepare to revisit our immigration laws, we write to express our broad consensus that immigration is one of America’s significant competitive advantages in the global economy. With the proper and necessary safeguards in place, immigration represents an opportunity rather than a threat to our economy and to American workers. DDT’s point system limits the number of low-skilled workers for farms and dairy. It can also let DDT decide which immigrants—probably non-white—to exclude. Supporters of the system use Canada as an example, but that country has started to focus on the needs of specific industries. For example, the U.S. needs tech workers and agriculture laborers. DDT’s system eliminates the latter industry, and experiments in states—including Perdue’s Georgia—limiting immigration show the resulting devastation. Even if unanimous among GOP senators, the Senate would need eight Democrats supporting the bill. It also doesn’t fit with DDT’s increasing the number of H-2B visas for non-agricultural industry workers like his workers at Mar-a-Lago. Before that he suspended the “premium processing” option for H-1B visas for highly skilled workers. At the same time that DDT wants to cut back on immigration, his senior adviser and son-in-law has been subpoenaed regarding Kushner’s selling EB-5 federal visas for $500,000 each as “investors.” EB-5 applicants do not have to provide “skill,” including the ability to speak English. Kushner’ sister, Nicole, has used Jared Kushner’s name to lure investors, and Jared is connected to the company that seeks Chinese investment. The past six months have shown that Republican legislation know nothing but sledgehammers.